Bountiful Harvest Treasure Trove Now Live! This new Treasure Trove is ripe for the picking, available September 12–October 3. The temperatures are beginning to cool, but this harvest is hot! The Bountiful Harvest Treasure Trove is now available until October 3. Find all the details and rewards below! Each character level 36 and above can open the Treasure Trove once per day for free during the event period. 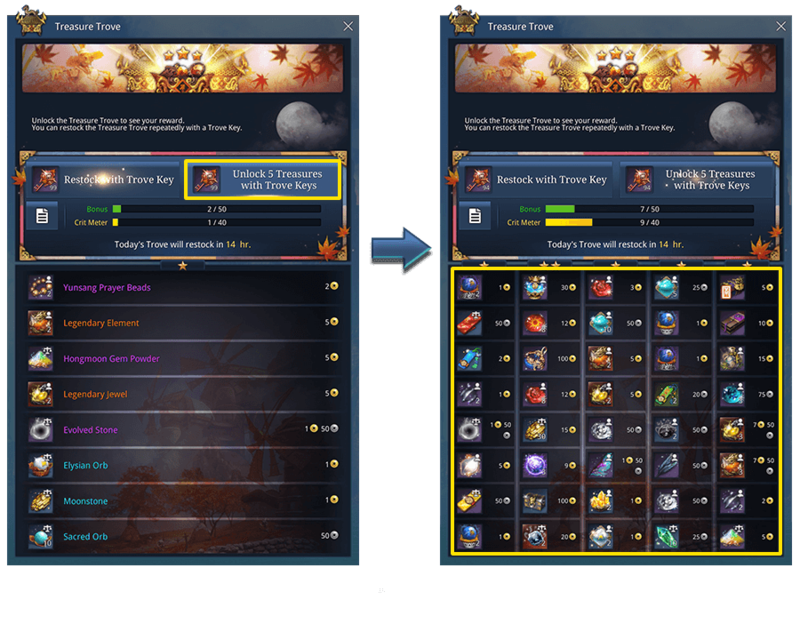 Opening the Trove will give you the opportunity to purchase any of the items you see with gold, but you can only purchase one item per Treasure Trove Key used! Six additional Treasure Trove slots can be opened with Treasure Trove Expansions purchased from the Hongmoon Store, which will unlock these slots for the entirety of the Treasure Trove period. These additional slots increase your chances of seeing a valuable item, so it’s a good idea to unlock them early. Additional Treasure Trove Keys can also be purchased, but if you’re looking to buy several keys or expansions at once, be sure to check out the bundles below. 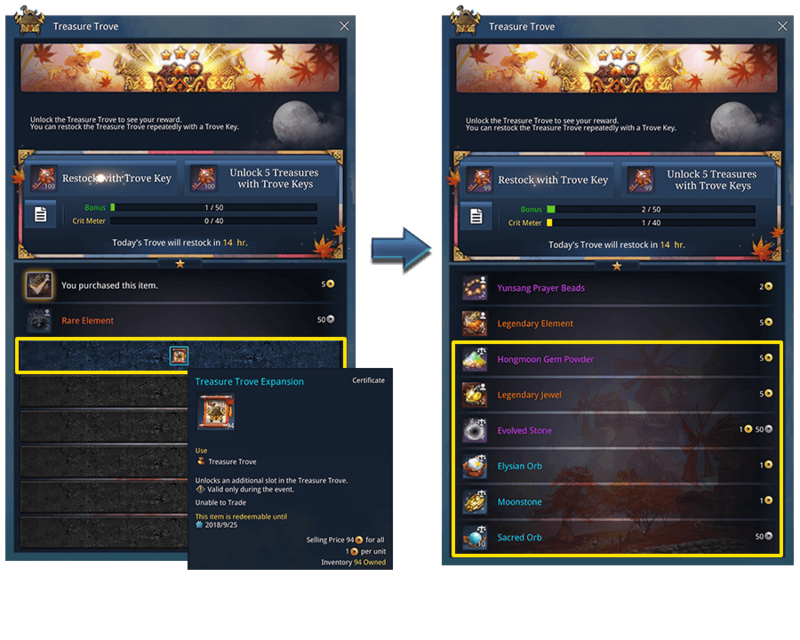 If opening each Trove one at a time is too slow for you, you can speed up the process by opening five at once! It works exactly like opening one Trove, just five times more fun. You’ll use five keys, and gain the respective amount of progress toward the Guaranteed Rewards. You can find the rating of each Trove you unlock by looking at the stars at the top of the window. Most of the Troves you unlock will be one star, but it’s possible to receive two or three stars. The more stars, the more desirable the rewards! The Crit Meter is a way to guarantee you’ll receive at least a 2-star Trove. For each purchased Treasure Trove Key you use (free daily keys don’t count), you’ll increase the Crit Meter by 1–3 points (or 5–15 if you unlock five Troves). 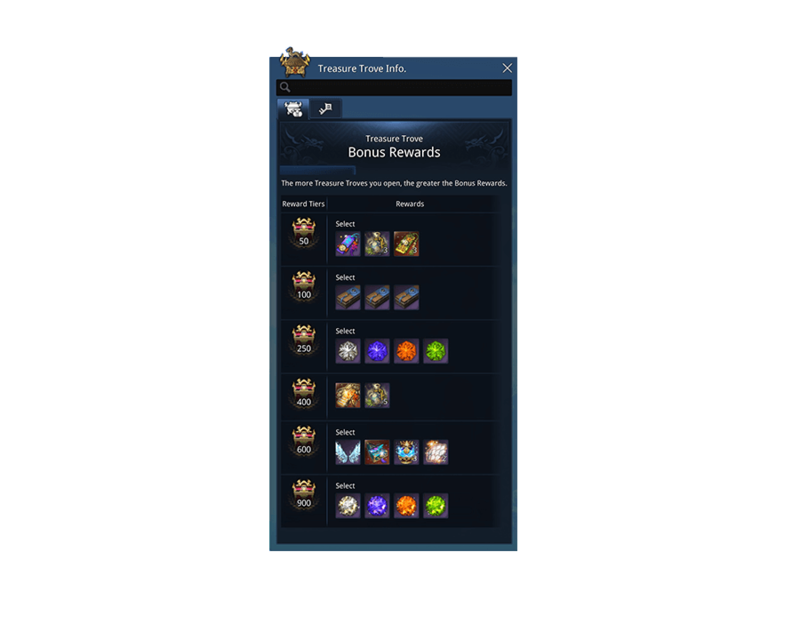 Once the bar has reached its maximum of 40 points, your next purchased Trove Key will guarantee at least 2 stars. 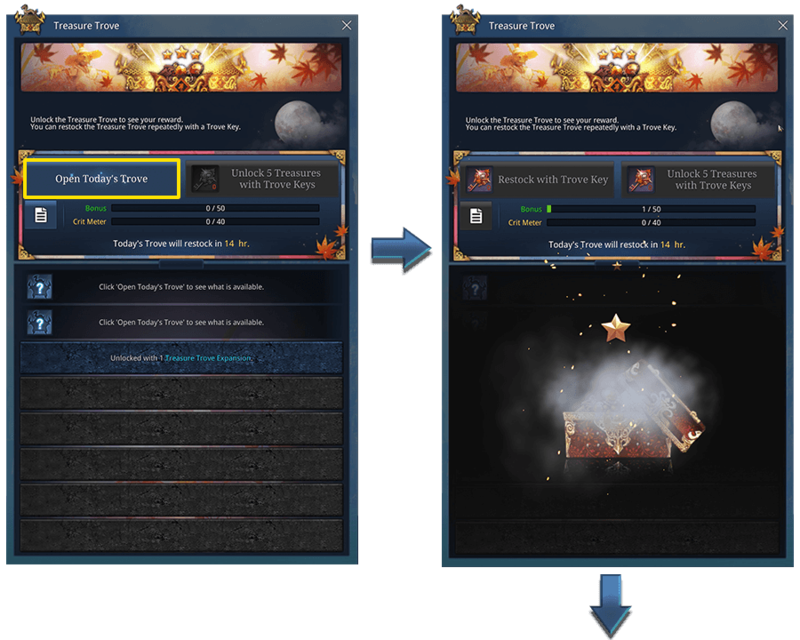 Bonus Rewards is a progressive system that gives you extra items simply by opening Treasure Troves. There are milestones you can achieve based on how many Troves you have opened, with each milestone offering items on top of the rewards you’re already getting. 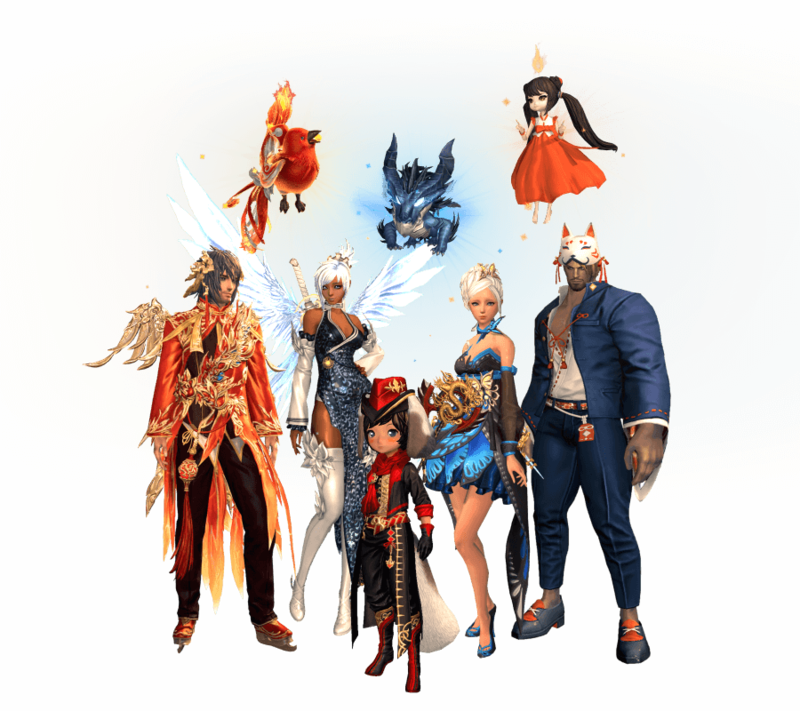 These items include extra Hongmoon Experience, gems, cosmetics, and more! You’ll have guaranteed access to some of the most sought-after rewards even if you don’t get them when opening a Treasure Trove. You can find the entire list of items and accompanying milestones by clicking the Treasure Trove Info. button on the Treasure Trove interface. The Treasure Trove Key and Treasure Trove Expansion bundles are available again. Buy more and you’ll save more with our bundle discounts! 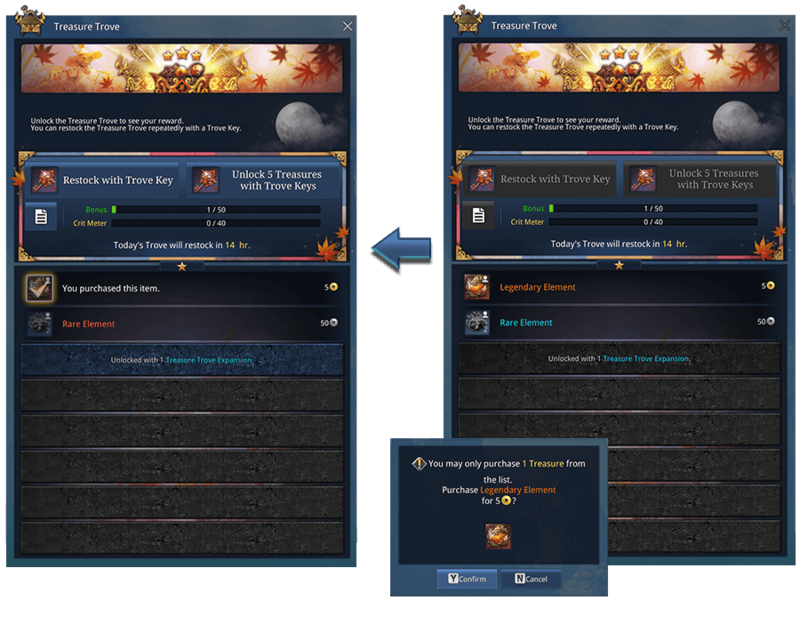 Premium Members are also able to pick up one free Treasure Trove Key for 0 Hongmoon Coin by visiting the Hongmoon Store each day. Above items will be available until the October 3 maintenance. As with any harvest, a large yield is best. With the Bountiful Harvest Treasure Trove you’ll find just that—a wide variety of rewards suited for every taste. This Trove’s assortment includes Gilded Triangular Gems, Aransu & Raven Prisms, loadsof upgrade materials, consumables, and cosmetics to fall for, plus a whole lot more! Also rising from the ashes is the return of the Grand Phoenix Costume Set in case you missed it before. The Bountiful Harvest Treasure Trove is open September 12–October 3; crack one open and find out what’s inside while it’s still fresh!